This Woman Bought Coffin and Flowers for Her Own Wake! Find Out Why She Did It! 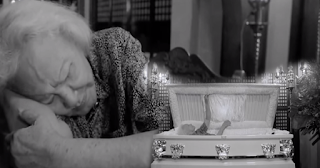 Here’s a sad story of an old woman that will surely touched your heart. This short film will serves as an eye opener to the people who left their old parents alone and live on their own. It is not bad to leave your home and start a new family. The worst part is to abandon and forget them while you are living on your own. The video starts when this old woman ordered coffin and flowers for her own wake. However, the young lady here who delivered the stuffs tried her best to convince the old woman to return the things and just live and forget about her death because she’s still looks healthy behind her old age. The story became sadder when it comes to the part where she recalled all the memories of her husband from the moment before they got married until his last breath and her displeasure to their children who left her and never visit again after they migrated to Canada. Here, watch the full story and find out how the sadness kills her!